Absi Classic Acrylic Trophies is the name given to a set of trophy collections made from thick acrylic sheets. Models within these collections are grouped according to their geometric shape. Most models offer a wide space on their body to carry your own message and graphics. Your design can be laser engraved or printed on the trophy's body. 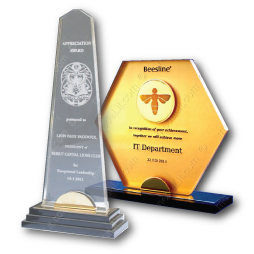 Engraved zones appear milky white on clear transparent surfaces, but they can also be color-filled. Laser engraving and digital printing can be combined to produce great dramatic effects such as producing a frosted engraved design on any printed pattern or colored design. Many models have a base distinguished by a matching set of metallic base-top and base-to-body clip and can be accessorized with a high quality gold-plated or silver-plated medal as an option.